Is three-tab the most popular? If not, what is the most popular kind you sell? What makes it last so much longer than the three-tab roofing? How can homeowners find a roofing contractor that they can trust? Do a majority of your projects go through insurance? What about roof repairs? Do you see a lot of those, too? What’s the most common type of roofing repair that you see? How much do you think materials are influenced by trends? Do you see some roof types come in and out of fashion? 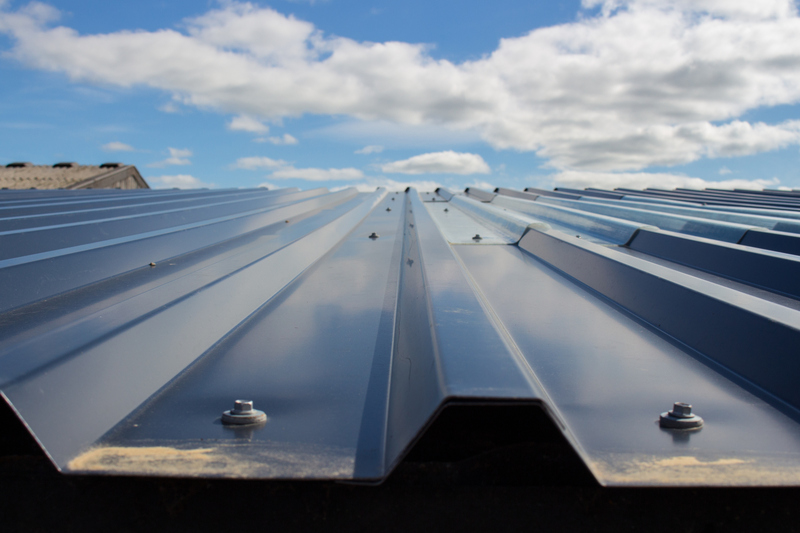 Do you end up doing a lot of flat roofs? Have you ever seen leaks with those? What if a customer has an emergency repair? What’s the best thing for them to do if there’s a major storm? Do you offer any warranties on your labor when you install a roof? Have you ever installed a new roof and been called out for a leak right afterward? What happens in that situation? Do you ever pull off a roof and realize that it’s just totally rotten underneath? Since you own this company, and you’re one of the few female roofers, do you feel like customers respond differently to you? What else makes a good company stand out? We’re certainly glad to hear there are people out there who follow through. Thank you so much for talking with us today, Ami. The vast majority of roofers are honest and do good work, but every once in a while, homeowners get hooked by “storm chasers,” roofing contractors who come in after a major weather event to fix homes that were damaged by recent storms. These roofers can’t always be trusted to do the job right—and sometimes they aren’t available for fixes if something goes wrong after the repair. Today we talked to Ami Feller, the owner of Feller Roofing in New Braunfels, Texas, to discuss roofing materials, repairs—and what makes an honest roofer. It depends on how long the shingles you bought are meant to last, whether they have a life span of 20, 25, 30, or 50 years. You can usually judge based on that, and replace your shingles two or three years before the end of the lifespan. That said, you’ll also want to have your roof checked after any major weather event. For hail, golf ball-sized or bigger usually means that your roof probably has some damage. And for winds, if they’re over about 50 miles per hour, you want to have it checked—especially if you have a three-tab roof. It varies by region of the country, but in Texas, we’re about 50/50 three-tab versus architectural. Other areas of the country are moving towards architectural shingles—also called dimensional. It’s a much better shingle, lasting for 50 years versus 25. I advise homeowners to get architectural shingles. The three-tab actually has three tabs on it, each tab measuring a foot, so shingles are usually about three feet long. But the three tabs can catch in the wind. The dimensional or the architectural shingle are made out of one solid sheet. They put a second layer on part of it to give it that wood shake look. That ends up being a heavier shingle so the wind can’t get underneath it as easily. Well, especially after a storm, that’s when storm chasers come in sometimes—they’ll go out and get local phone numbers and business contacts. So after a storm hits, you’re almost better off just waiting a little while until all the craziness goes away. The storm chasers usually leave after about six months and everything settles down. Generally, as long as the storm damage isn’t too bad, you have about six months to a year before you’re going to have a problem anyway. So I would always go with a referral instead. That way you know somebody who’s used them and were happy with them. If you don’t have a referral, do your research online, and make sure to read their reviews. Check the Better Business Bureau to see if they’re a member and how long they’ve been registered there. Make sure they’ve been around for a little while, like any contractor. Finally, make sure that they’re licensed and that they have insurance. There are a lot of companies out there that will offer to pay your insurance deductible—that’s actually insurance fraud. I tell people, if the roofer is willing to cheat the insurance, what are they willing to do to you? Just be careful. I would say about 50/50. There are some companies that only do insurance claims. We don’t do that, we do both. Yes, we don’t make a lot of money on those. We try to be reasonably priced on our repairs, although a lot of times, we’ll go out to look and a homeowner actually needs a whole new roof. There are some roofers who don’t do repairs, though. I would say replacing a tab on a three-tab roof [that’s blown off] from wind. Another really common one is where the PVC pipes come up through your roof, for your plumbing. There’s a boot around there, and a lot of those are made from rubber and they can give out. So we replace those a lot, too. Chimney repair is common, too. A lot of times they weren’t flashed right in the first place, and then they’ll leak like crazy. When we have a chimney leak, we have to redo the whole thing. Usually it’s just more about homeowner preference. The big thing with metal (a popular material right now) is that people think that it will last forever, but it won’t. It costs about one and a half times as much, and it lasts about fifty years. But the architectural shingles last about fifty years, too. So if you’re looking for value, the shingles make more sense. But if you’re after the look [of metal], then you want that look. I tell people, don’t do it because you think it will last forever, because it won’t. I’ve ended up fixing a lot of them. But with flat roofs, that’s why they leak, because people don’t use the right products. For anything that is less than a 3-12 (a common measurement of roof pitch), you can’t put a shingle on it without doing something else, like an ice and water shield. But a lot of people will just throw shingles on there, and they end up leaking. That’s why you have to put a product on that’s made for the pitch. Well, they need to get a tarp. And unfortunately, that costs money. We charge $300 to $450 to go out and put a tarp on. But the nice thing about that is that if the insurance ends up covering the roof, they will pay for it. The quicker you can get it covered and stop the leaking, the better off you’ll be, because that will prevent interior damage. But if you’re only missing one or two tabs, it’s probably not going to leak. This would be more like if the storm ripped it off. There are some repairs people can do themselves, as long as they’re comfortable getting up on the roof. But we’ll do it, too. Yes—for a full roof we’ll do three years, and we also have some through GAF. They have some extended warranties where they will pick up our workmanship. If people want to get that level of warranty, of course we charge for it, but they have one with a ten-year warranty, and one where they’ll take it up to twenty-five. And then on repairs, we offer one year. It doesn’t happen a lot, but it has happened.We go out and figure out what went wrong and fix it immediately. If there’s any interior damage, then we refund the homeowners. Usually, it happens because it was leaking beforehand and nobody mentioned it, so we didn’t know there was an issue in the first place. Very rarely. When you go out and do the estimate, you can kind of tell. And we automatically include three pieces of decking, which is pretty standard in the industry. So that covers 100 square feet, which is a lot. If it goes beyond that, we just charge $50 a foot, and we tell people that, but it doesn’t happen very often. Because usually you can tell before you get into it. I used to feel like customers were trying interview me to see if I knew what I was talking about, like trying to throw me curve balls. But once I answered all of those, then they’re usually very, very satisfied. But I walk them through the whole process and answer any questions they want. I also educate them on what they’re going to get and what they should be looking at, because those aren’t all the same. Women generally appreciate that approach. I have male salespeople—but we try to educate the customer no matter who they are. Answering the phone and calling people back, even when it isn’t pleasant. I hear so many stories of people who had a roof done—but the customer can’t get a roofer to come back out to fix a leak, for example, because they quit answering the phone. I always tell people, yes, there might be issues, but I’m not going to abandon you. We will be back, and we will make it right. I believe in just being honest with people, standing behind what you say you’re going to do, and doing it.